Miss Nightingale is a British musical set in the 1940, in London, and is the story about the nurse/aspiring singer Maggie (Lauren Chinery) and her friend George (Matthew Floyd Jones), who is a Jewish refugee. When the impresario Frank ( Oliver Mawdsley) arrives, he falls in love with George, and they start a closeted and problematic relationship. 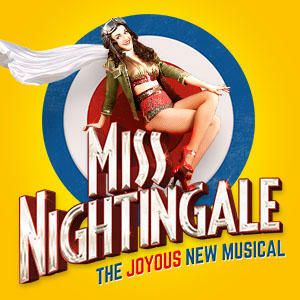 After touring and a run at The Vaults last year, Miss Nightingale arrived to the West End. Even if the story is about secrets, illicit relationships, blackmails at the time of the war, the show is full of joy and fun. Some of the songs are very cabaret style and it is impossible not to laugh when the very good Maggie/Lauren sings them. Remarkable and intense is the song This man of mine, sung as a trio. The cast not just act and sing but they all play also the instruments. They all do a good work – especially Matthew. The dialogues can sound a bit cliché and somehow old and obviously the world has changed so much since 1940. Also, the stage is well designed but changes minimally and I would probably have expected more fantasy in a West End production. A fascinating show with nice songs all well performed and a good balance between comedy and drama.